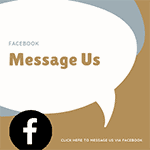 Blog | Bartok design Co. Blog – Page 21 – Bartok design Co.
how can I properly comment these pictures? 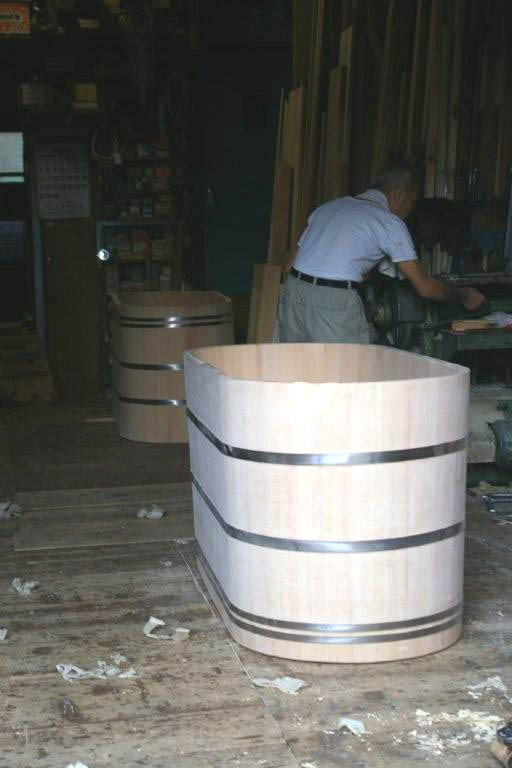 In these pictures it is easy to understand how the side walls of a hinoki tub are laminated. 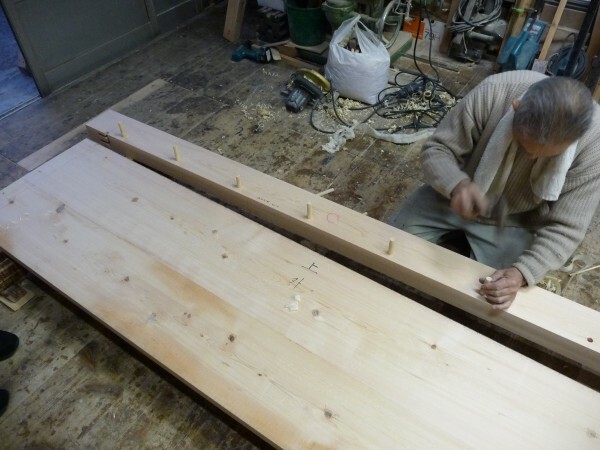 First the material is assorted so that knots or other imperfections get discarded and of course, so that the total width of the planks is equal on the four sides of the tub. 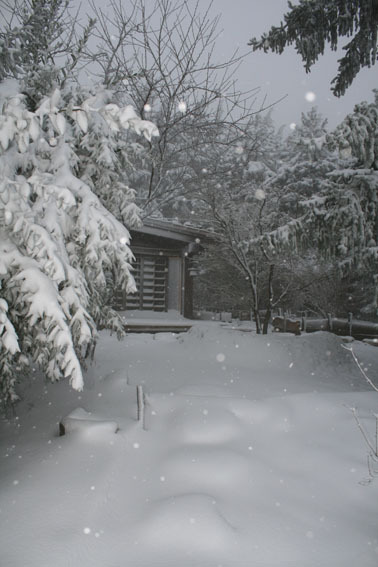 This is also a way to optimize the use of the material and avoid loss. 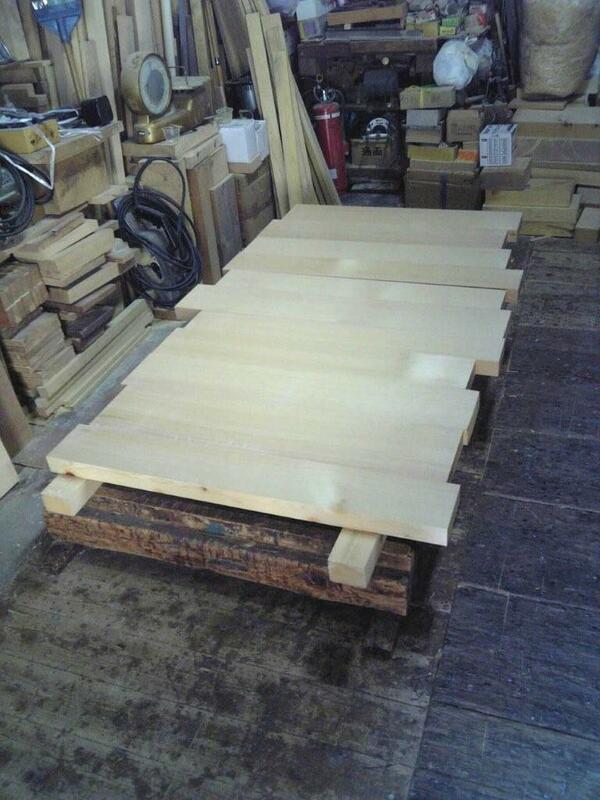 The wood is hand sawn by overlapping 2 planks so that with one single cut two perfecly matching planks are cut. 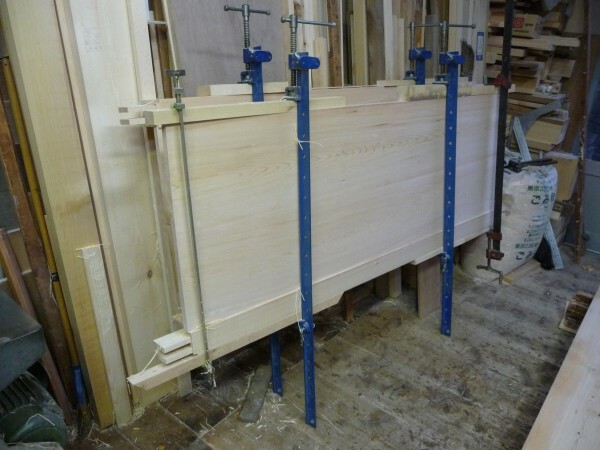 The pictures show the phase when the planks are drilled and connected with woodes plugs (dabo). 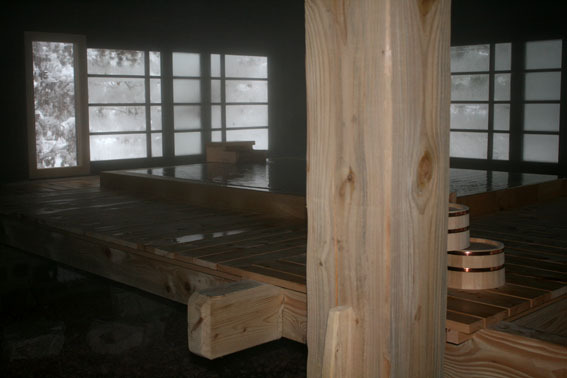 The planks are joined with a waterproof bond and kept in the press overnight. 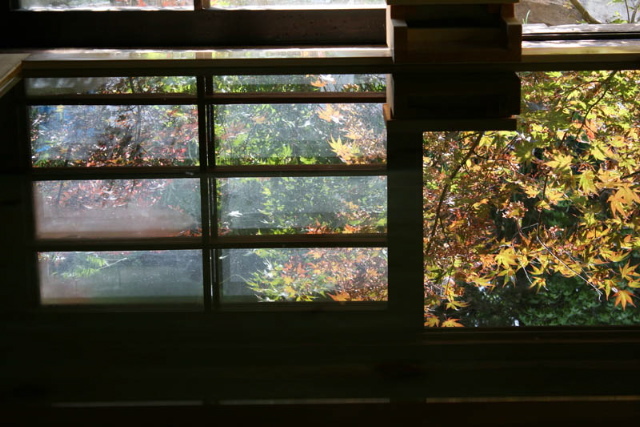 The corner of the tubs are realized with a more complex joint which is sealed by the insertion of hinoki wood bark which acts as a kind of natural gasket. Moreover, this bark has excellent fungicidal property and prevents mold stains in the most vulnerable point (the corners). What am I doing here!? Actually, today we showed our material and products to a perspective customer from Germany who is visiting Japan. It is always a pleasure to have a tea together and exchange thoughts with fellow westerners who share with us passion for japan and fine hand crafts. We looked at the plans and after some talking, we felt it might be easier just to try one tub, as you would do with a pair of boots. We had an “outlet” tub and the client could enter and get a more direct idea of the size and of the feeling of the tub. Even a smaller tub seems spacious and comfortable when you try it. No big surprise, the sizes we were recommending actually did fit perfect, anyway after trying the tub the client could feel reassured and move forward without worry. 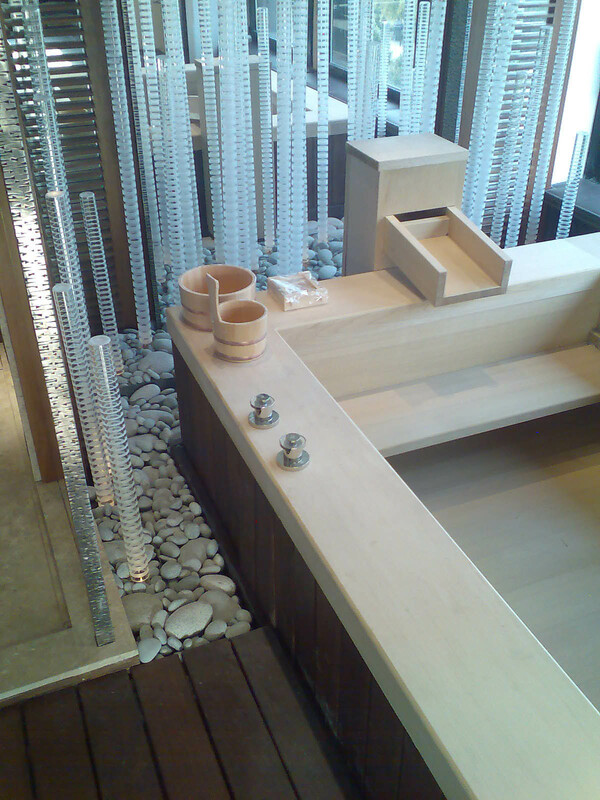 If you visit Japan, drop by for a tub fitting (if you let us the time we can pick you up at JR Maihama station). 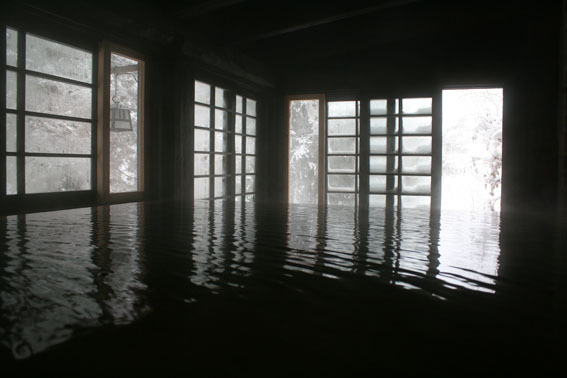 These large round tubs were made for a hot spring luxury hotel near Mt. Fuji. 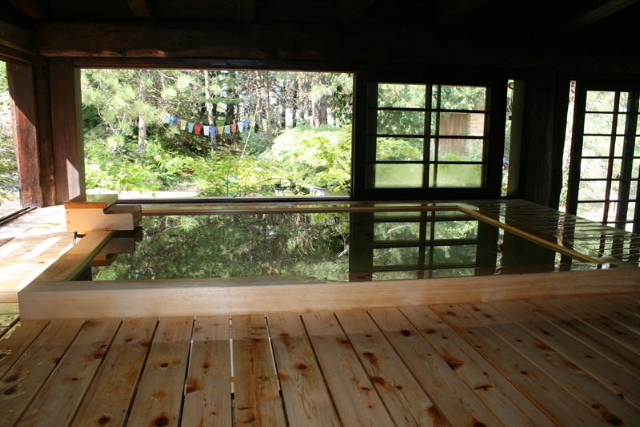 Can you imagine how would it be to take a hot bath inside? On the other end, how much is our physical and mental health worth? We do not have statistical data but it is known that a relaxing bath a day improves almost all body functions and extend life-span. Additionally it is also believed to improve relations and productivity. 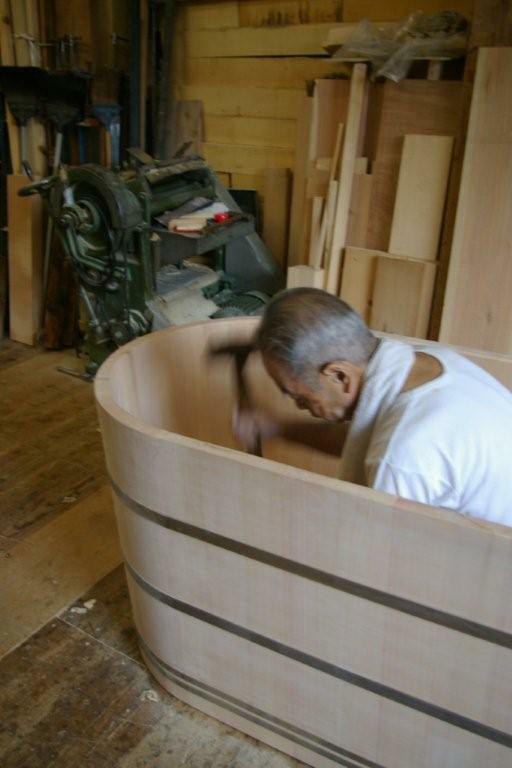 Here is how we are building the 100% natural tub in the traditional way. 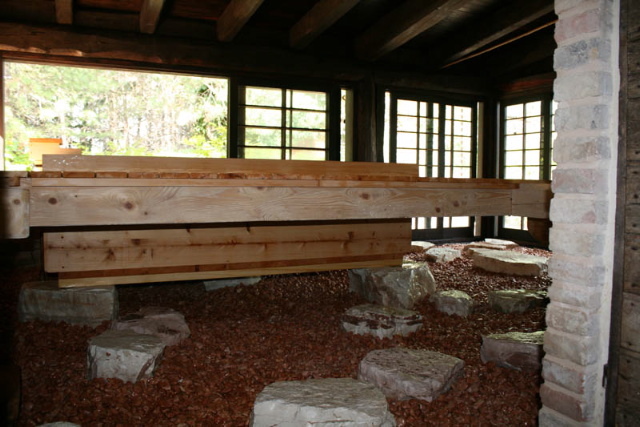 The shape most suitable is the “TARU” which is assembled like a barrell with vertical planks of hinoki. The water pressure distributes uniformly on the perimeter and is collected by the stainless steel bands hammered from the bottom up. 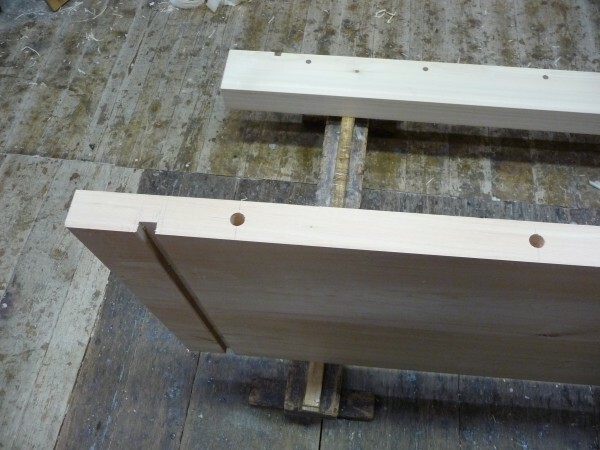 The hinoki planks are cut with variable angles so to match eachother seamlessly. Between these we used a natural bond made of rice starch called “SOKOI”. This is 100% natural and does not contain anything but rice and water! 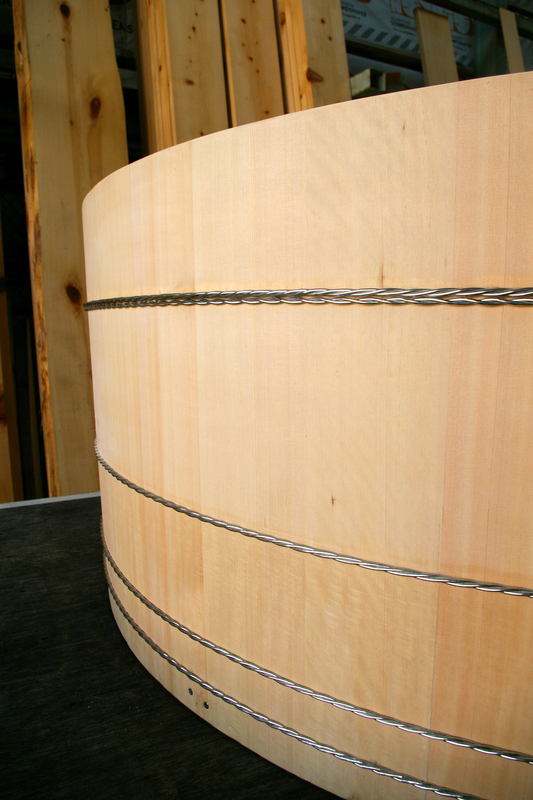 Of course all our tubs are natural: we only use wood and do not treat it with any chemical or coating agent. 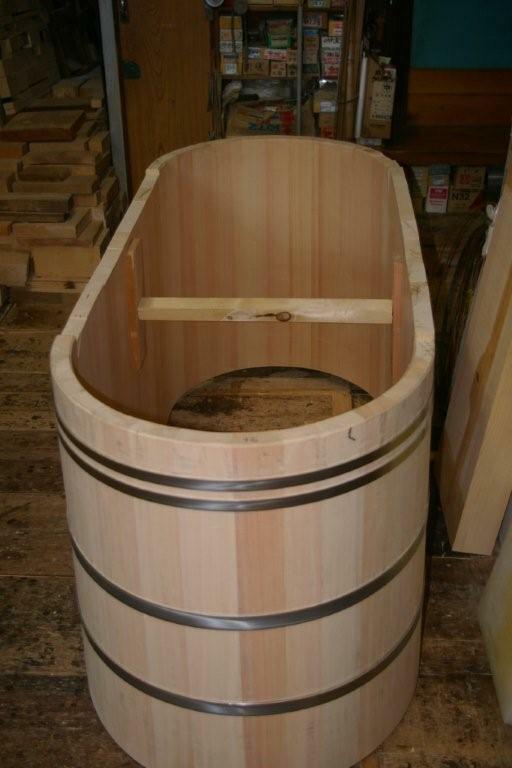 How can you make a tub which is more natural than a wood tub? 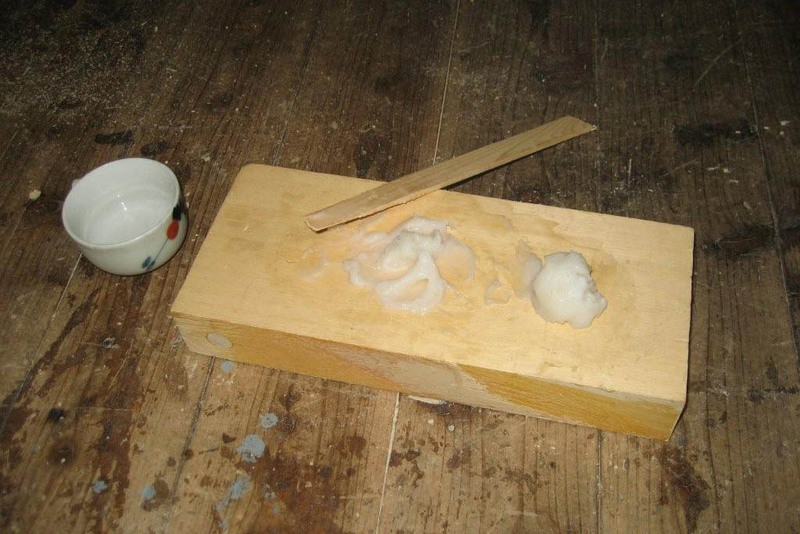 Actually we do use some bond inside the joints of our tubs. We prefer epoxy bond instead of urea based products because it is long lasting and safe for the health. Anyway this time we received an interesting challenge. 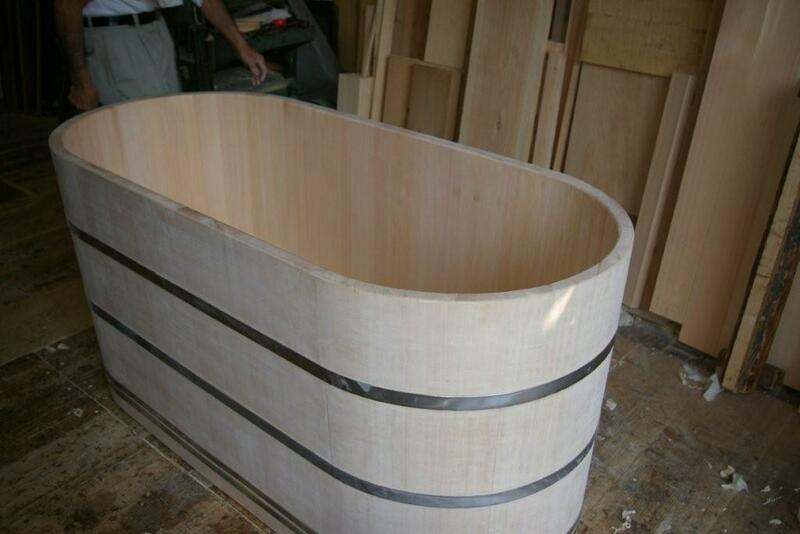 We were required to build a 100% natural tub (actually 2 tubs), without the use of any synthetic material. 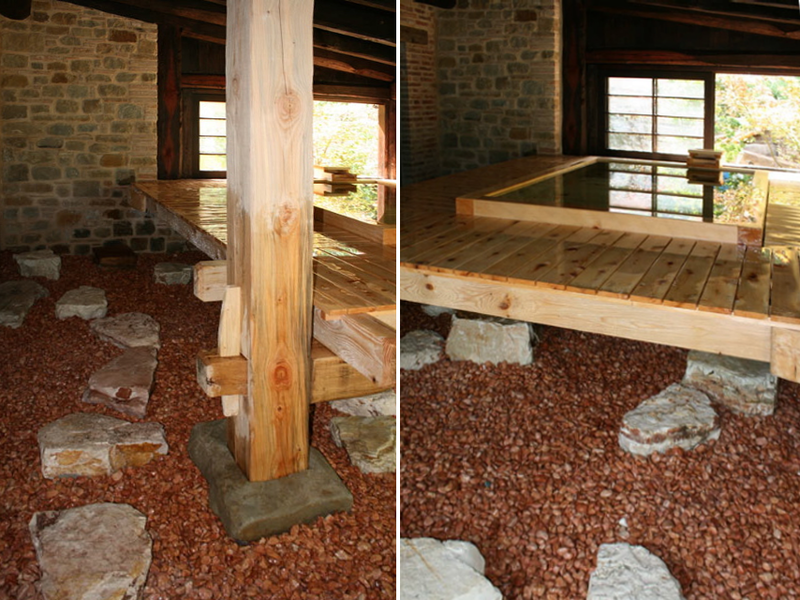 We had to resort to the knowledge and wisdom of our carpenter`s father who dedicated great passion and almost 3 weeks of work for this project. It was really a great chance for passing down the ancient tecnique (and art) to the younger generations. It was more than 50 years since he last used the this construction method! Read some more details in the next entry. Here it is, our tub installed in a landmark attic in the bellybottom of Paris. The creative decoration of the bathroom with a revisitation of the stone garden theme show how a natural wooden bath can go well both in traditional or contemporary settings. 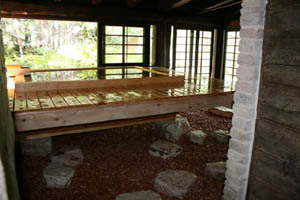 The floor in iron-wood wraps up to finish the ledge of the tub which is built-in type. In the large bath area there is also a shower-box and extra long vanity counter. Also in this case, I cannot but agree…!